Thomas Defriece of Damascus, Virginia, exchanged some Facebook messages with me in the spring about a mystery bird at his home. Photo by U.S. Fish & Wildlife Service A male Baltimore Oriole will seek out elevated perches for the purpose of singing their songs. He noted that he is originally from Maryland, where the Baltimore oriole has long served as the state’s official bird. “I’ve never seen an oriole, so I was excited,” he wrote in his Facebook message. I believe that he was correct in his identification of a bird that I’ve found rather uncommon in most parts of southwest Virginia, northeast Tennessee and western North Carolina. The Baltimore oriole, despite its bright plumage, is a member of one of the blackbird clans, known in scientific circles as the Icterus genus. In his book, “Birds of Forest, Yard, and Thicket,” John Eastman notes that there are 26 species in the genus, eight of which nest in the United States. In the eastern United States, there are only two orioles — the Baltimore oriole and its smaller relative, the orchard oriole. The western half of the nation is home to a half dozen orioles, including Bullock’s oriole, Scott’s oriole, Audubon’s oriole, hooded oriole and Altamira oriole. I saw several gaudy, noisy Bullock’s orioles during a trip to Utah in May of 2006. Photo by Bryan Stevens A migrating orchard oriole explore a blooming forsythia. 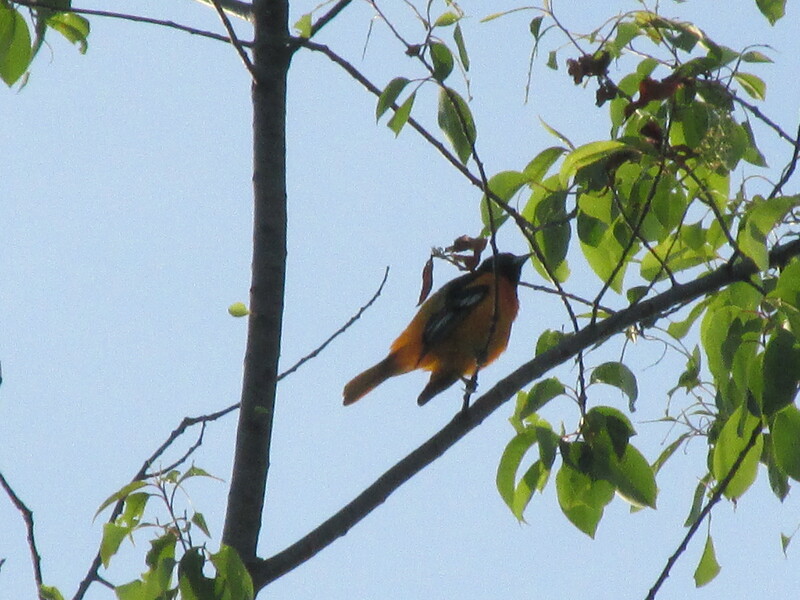 I actually have better luck finding the orchard oriole closer to home. I have learned that tall trees are an essential part of the Baltimore oriole’s favored habitat. Baltimore orioles are well-known for their colorful appearance, but their fame also rests with a sack-like nest that Eastman describes as a “durable marvel of tight-woven plant fibers” in his informational book. Eastman also notes that during another era in America, the Baltimore oriole often built its marvelous nests in American elms before Dutch elm disease almost eradicated these trees from the landscape. He reports that maples, willows and apples have served as nesting trees in the absence of elms. Once the hard-working female oriole sets to work, she may spend eight days or longer weaving plant fibers into a strong pouch suspended from the outer ends of drooping branches. The durability of the nest means that other birds, including house finches, may occupy the old nest once abandoned by the original inhabitant. 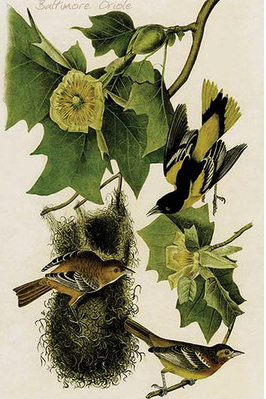 Early naturalist and artist painted the Baltimore Oriole with the birds unusual nest. Orioles are present in the region from April to October, generally retreating to the American tropics for the cold months of winter. There they may live on plantations that produce such much-coveted crops as bananas, coffee and cacao, which is the essential ingredient for chocolate. 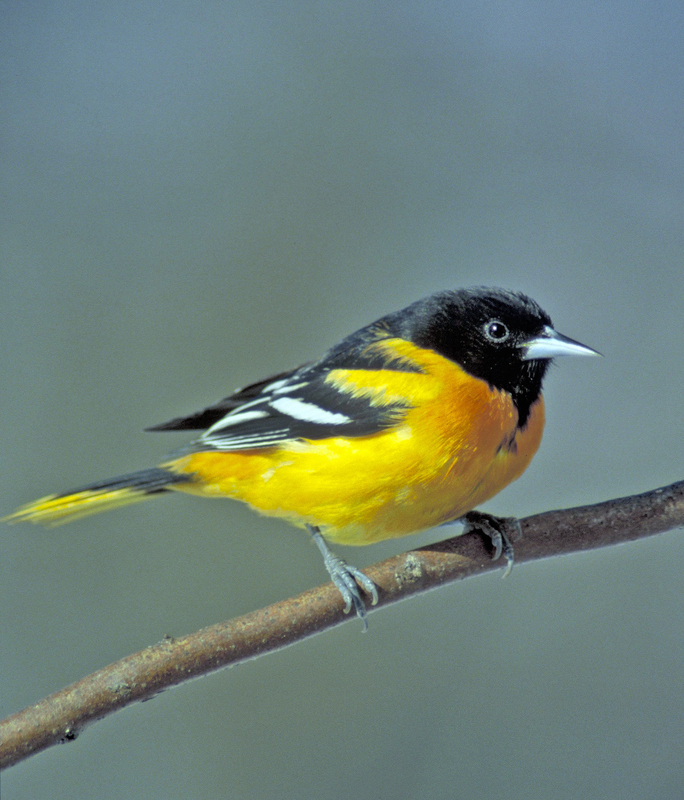 The Baltimore oriole is named in honor of one of the founding fathers of the state of Maryland. George Calvert, or Baron Baltimore, was an influential English colonist instrumental in establishing the colony of Maryland. His servants wore orange and black uniforms, which inspired early American naturalist Mark Catesby to name the bird the Baltimore oriole. The bird’s association with the the city of Baltimore and the state of Maryland have continued to this day. The bird is also famous as the namesake of one of America’s professional baseball teams. Baltimore orioles eat insects and fruit, but these adaptive birds have also developed a fondness for sweet nectar. Orioles no longer have to raid sugar water feeders meant for hummingbirds. Many manufacturers of bird-feeding equipment now produce affordable sugar water feeders specifically designed for use by orioles. Many bird enthusiasts also use orange slices and grape jelly to lure orioles into their yards. I’ve tried these tricks, but I’ve attracted more gray catbirds and scarlet tanager than I have orioles. Close relatives of the orioles are the oropendolas of South and Central America. Oropendolas are large birds with pointed bills and long tails. They are usually also at least partially bright yellow in their coloration. The oropendolas put the oriole to shame, however, when it comes to building nests. Although of the same basic design of an oriole’s nest, the oropendolas construct pendulous nests that may hand down more than three feet. These birds, unlike orioles, nest in colonies. So these huge, hanging nests are multiplied, with a single tree sometimes holding dozens of nests. Photo by U.S. 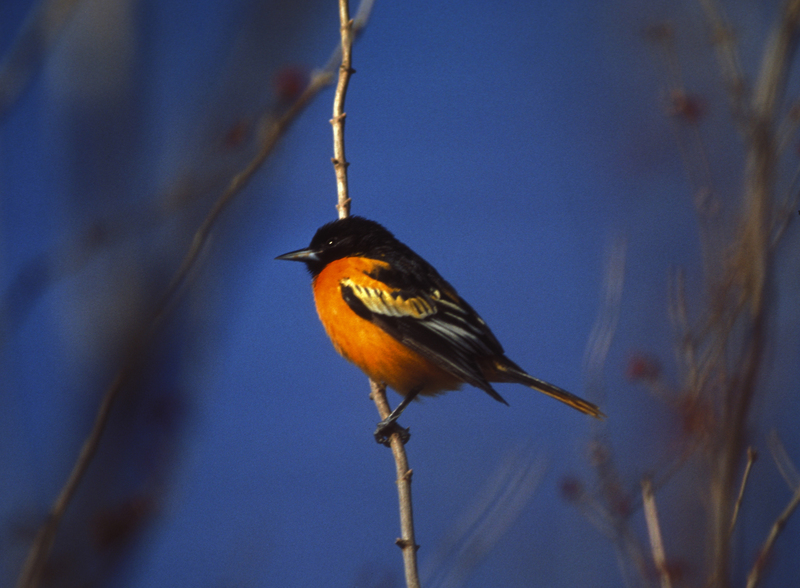 Fish & Wildlife Service The Baltimore oriole is a bird known for its bright plumage. If you’re fortunate enough to have a Baltimore oriole as a neighbor, it isn’t only their bright coloration and elaborate nest building that recommend these birds. They’re also one of the few birds willing to eat the hairy tent caterpillars that are often a blight on the landscape. Back in the late 1990s, I observed a male Baltimore oriole visiting a large caterpillar tent in the branches of a cherry tree. The bird methodically plucked the caterpillars from the silken tent, eating them one after the other. While many birds avoid some of the spiny and hairy caterpillars, orioles actively seek them out and do a great service of reducing the damage these hungry caterpillars can inflict on the environment. Photo by Bryan Stevens Baltimore orioles often perch in the tree canopy, making them difficult to observe. Orioles must have found the Defriece home in Damascus to their liking. 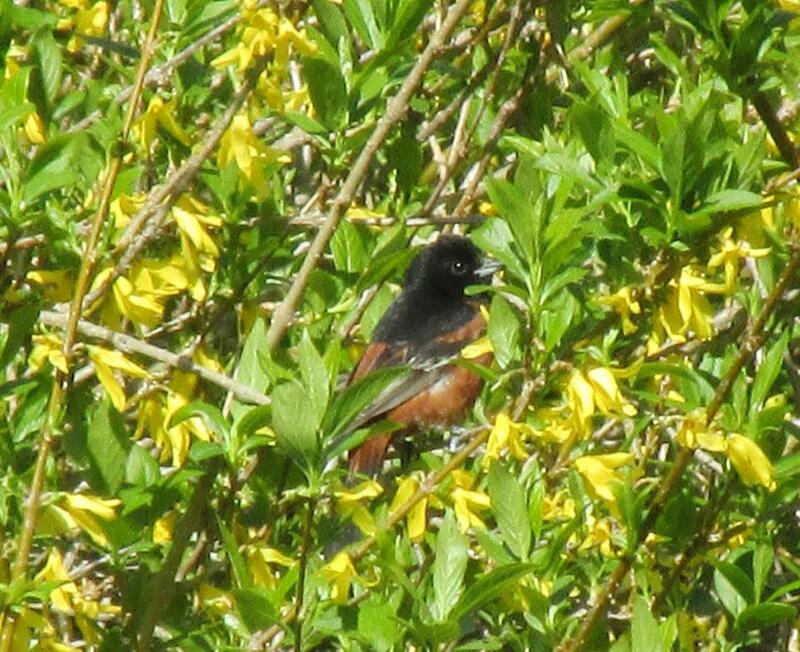 In subsequent Facebook messages, Thomas informed me that he has seen the male oriole again, as well as a female. Perhaps the birds decided the location was a good one for nesting. For most of our birds, the nesting season is winding down. A few species, like cedar waxwing and American goldfinch, are just now starting to think about nesting, but most birds have already finished with the work of ensuring a new generation of their species. At my home, I’ve been seeing young birds join their parents at my feeders. Northern cardinals, Carolina chickadees, song sparrows, and white-breasted nuthatches have all introduced their offspring to the supplemental food provided by my feeders. This entry was posted in Uncategorized on July 17, 2016 by Bryan Stevens.